Know more about our background and what we can do for you. At Talk and Play, LLC., we understand that communication is an essential life skill. Our main goal is to help children become effective communicators to connect to friends, family and community. Our services include a play-based approach in speech language therapy that target receptive and expressive language skills, literacy support to help increase reading skills and guided play groups to promote speech and language development. Amy Anderson Moncy is an American Speech Language Hearing Association (ASHA) certified speech-language pathologist and a certified educator with over 23 years of experience serving children and adults with a variety of speech and language disorders. She has a Doctorate in Speech-Language Pathology from Nova Southeastern University and a Master’s Degree in Speech-Language Pathology from the University of the District of Columbia. 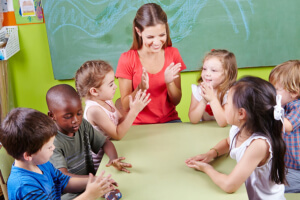 She has experience working with children who face communication challenges secondary to diagnoses of developmental delays, speech and language disorders, apraxia of speech, motor speech disorders, autism, and learning disabilities. Amy has worked in a variety of settings that include early intervention, Head Start School Readiness programs, hospitals, outpatient rehabilitation, home health care, and schools. We are excited to welcome you and your child to our program. To know more about our programs, please talk to us at (860) 235-1104.